After a long stint above it, the S&P 500 tested its 200-day moving average several times over the past week before finally breaking below it; what does this development suggest for the index going forward? Much attention this week has been paid to the long-awaited break of the 200-day simple moving average (200 SMA) by the S&P 500 (SPX). 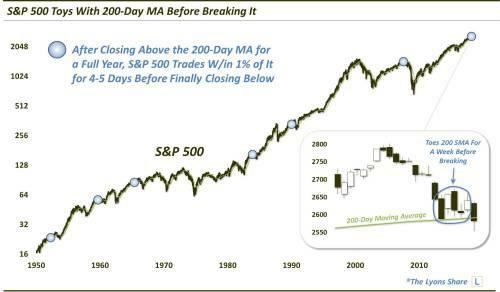 The big “to-do” is understandable given the fact that the index had spent over 400 consecutive days above the 200 SMA – just the 4th streak over 400 days in the SPX’s history. The question on everyone’s mind is what does the end of the streak mean for the SPX? For us, the most noteworthy aspect to the development was the behavior of the SPX leading up to the 200 SMA break. Specifically, the index “toyed” with the 200 SMA for a week before finally closing below it on Monday. What we mean by that is that it tested the 200 SMA, trading within 1% of it for 5 straight days, prior to Monday’s break. Going back to 1950, there have been 6 other occasions that saw the SPX close below the 200 SMA for the first time in more than a year – after first toying with the SMA for 4-5 days. So what should we expect from this toy-then-break treatment of the 200 SMA? At first glance, the pattern is reminiscent of a bear-flag, or at least some variation of a continuation pattern. As such, we would be inclined to expect further downside based on a traditional interpretation. The said, everyone and their mother has eyes on both the S&P 500 and its 200-day moving average. Thus, we would also ascribe fair odds of a false breakdown unfolding, particularly due to the SPX’s overriding tendency to follow the least conforming path to traditional technical analysis. The latter scenario seems to be in motion in our current case. What do these 6 historical precedents tell us about what to expect (to the extent that a sample size of 6 can lead us to any conclusion)? Well, if you’re wondering whether there is follow-through to the downside or a “false breakdown”, there doesn’t seem to be a concrete template. Of the 6 precedents, 4 saw immediate follow-through lower while 2 saw immediate reversals to reclaim the SMA. Given our present case in which the SPX demonstrated an immediate recovery, we will mention that those 2 which immediately reclaimed the SMA did see some further follow-through in the intermediate-term. All that said, a cursory historical look at 6 precedents does not appear to prove very helpful. However, in a Premium Post at The Lyons Share, we take a deeper dive into the individual and aggregate action in the S&P 500 surrounding those precedents – with some very interesting and potentially useful discoveries. If you’re interested in the “all-access” version of our charts and research, please check out our new site, The Lyons Share. You can follow our investment process and posture every day — including insights into what we’re looking to buy and sell and when. Thanks for reading!